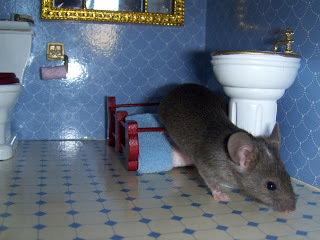 My kids were supposed to be getting ready for school, but when I went down the hall to check on them, they had their mice in the dollhouse and my daughter was taking pictures with my camera. I smiled and went to start breakfast. And now I’m wondering, does anyone have a dollhouse-sized mop? WOW! 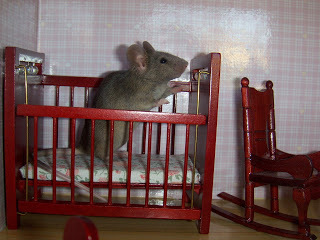 cute and scary all at the same time…..and i have flashbacks of Phoebe’s mice and dollhouse from the Friends TV show. What a sweet doll house! We had a Christmas mouse who showed up in our laundry room on Dec 23rd last year. 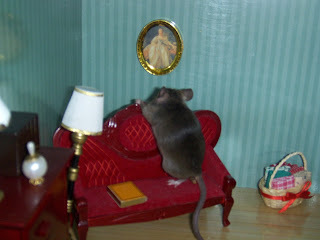 Let’s just say he wasn’t quite as spoiled as your little mouse . . .Have a blessed day! So cute! 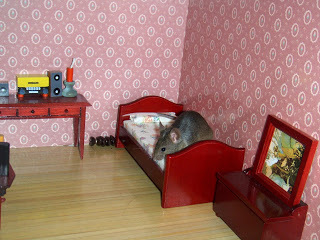 I am not a fan of mice,but yours sure is cute in his little house! awesome. shades of “the borrowers” and the “redwall” books…have your kids read those? That is just too cute! Very creative.